Loreto is a city in and municipal seat of Loreto Municipality, located on the Gulf of California in eastern Baja California Sur state, Mexico.The city of 14,724 people is located about 350km north of La Paz, the capital of Baja California Sur state.HistoryLoreto was the first Spanish colonial settlement of the Viceroyalty of New Spain on the Baja California Peninsula.The town was founded in 1697 by Jesuit missionaries, who found a steady spring of fresh water on this site, as the Misión Nuestra Señora de Loreto. Spend the 10th (Mon) exploring nature at Loreto Bay National Marine Park. There's much more to do: contemplate the long history of Misión San Francisco Javier de Viggé-Biaundó, discover the deep blue sea with a scuba or snorkeling tour, don't miss a visit to Malecon, and get outside with Loreto Guide with Said Orozco. To see more things to do, traveler tips, where to stay, and more tourist information, you can read our Loreto trip itinerary builder. Fort St. John, Canada to Loreto is an approximately 18.5-hour flight. The time zone difference moving from Pacific Standard Time to Mountain Standard Time is 1 hour. Traveling from Fort St. John in April, expect Loreto to be much hotter, temps between 34°C and 20°C. You will leave for La Paz on the 17th (Mon). It's no coincidence that La Paz means "peace" in Spanish, as this tourist center with a small-town vibe offers a tranquil atmosphere and blissfully pleasant weather throughout the year. Take a break from La Paz with a short trip to Palapas Ventana in La Ventana, about 52 minutes away. And it doesn't end there: step off the mainland to explore Isla Espiritu Santo, take a leisurely stroll along Playa El Tecolote (Tecolote Beach), contemplate in the serene atmosphere at La Paz Cathedral, and make a trip to Malecon. To find more things to do and more tourist information, read La Paz travel planner. Traveling by car from Loreto to La Paz takes 4.5 hours. While traveling from Loreto, expect somewhat warmer days and about the same nights in La Paz, ranging from highs of 38°C to lows of 18°C. Cap off your sightseeing on the 26th (Wed) early enough to travel to El Pescadero. El Pescadero is a small village in the municipality of La Paz in the Mexican state of Baja California Sur. Explore the numerous day-trip ideas around El Pescadero: Los Barriles (Fishing Charters & Tours, Spas & Wellness, & more), Rancho Ecologico Sol de Mayo (in Santiago) and Cabo Pulmo (Cabo Pulmo Marine Preserve & Scuba & Snorkeling). There's still lots to do: identify plant and animal life at Tortugueros Las Playitas, take in the dramatic natural features at Punta Lobos, look for gifts at Atelier Naica, and enjoy the sand and surf at Palm Beach. To find photos, maps, traveler tips, and more tourist information, read our El Pescadero holiday planner. Traveling by car from La Paz to El Pescadero takes 1.5 hours. When traveling from La Paz in April, plan for little chillier days and somewhat warmer nights in El Pescadero: temperatures range from 32°C by day to 23°C at night. Wrap up your sightseeing on the 5th (Fri) early enough to travel to Cabo San Lucas. One of Mexico's premier vacation spots, Cabo San Lucas lures pleasure seekers with its trendy restaurant scene, raucous nightlife, and, of course, picture-perfect beaches. You'll find plenty of places to visit near Cabo San Lucas: San Jose del Cabo (Playa Palmilla (Palmilla Beach), Ivan Guaderrama Art Gallery, & more). 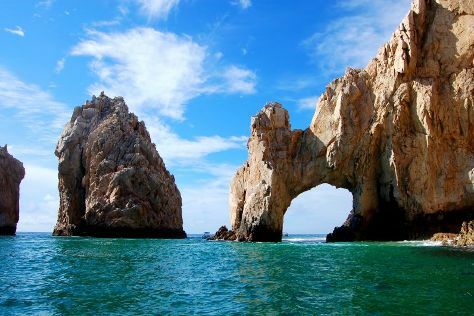 The adventure continues: take in the dramatic natural features at El Arco de Cabo San Lucas (Lands End), go for a stroll along the water at Medano Beach, enjoy the sand and surf at Chileno Beach, and see what you can catch with a fishing tour. 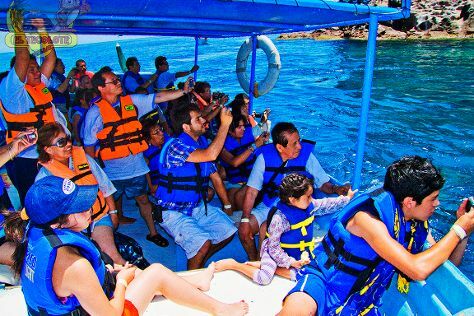 To see traveler tips, more things to do, ratings, and other tourist information, use the Cabo San Lucas vacation trip planner. Traveling by car from El Pescadero to Cabo San Lucas takes an hour. Expect a daytime high around 34°C in May, and nighttime lows around 26°C. Finish your sightseeing early on the 13th (Sat) to allow enough time to travel back home.